AICN EXCLUSIVE IMAGES! A Sneak Peek At Disney's New 3D CARSToons!! AICN EXCLUSIVE IMAGES! A Sneak Peek At Disney’s New 3D CARSToons!! Hey, everyone. “Moriarty” here. Last week, Toshi and I finished lunch and hopped in my car for a quick drive over to Burbank. I didn’t tell him what we were going to do. I just knew that, as a huge fan of CARS, he might get a kick out of what I’d been invited to see. I respect CARS more than I like it. I respect the film’s perspective on a vanishing American highway subculture, the way people used to enjoy the drive across America and stop to see what they were driving past. It’s got a romantic, sad undercurrent that I can tell was very personal to John Lasseter, and I certainly can understand why he told the story he told. But I’m not a car freak, and that romantic view of Route 66 isn’t something I personally feel, so I never felt a connection to the film. As a parent, I also respect the fact that the film may not work for me, but it makes kids into rabid animals. It’s amazing how much power Tow Mater and Lightning McQueen have over kids. There’s a reason this continues to be one of the top-dollar merchandising draws for Disney year after year. It’s crack. The designs hit a home run for little kids, and watching Toshi absolutely lose his damn fool mind for all things related to CARS, I have to respect that the film exerts a powerful hold. When I was invited to see the first of the theatrical CARS Toons that are coming out in 3D at the Disney Studios in Burbank, I immediately said yes because (A) it’s the first thing John Lasseter has directed since 2006, (B) it’s the first piece of animation that’s been designed in 3D by Pixar and (C) the Pixar shorts are often the fall-down funniest things they do. We met a group of a few other online writers (and, yeah, I was the only one with a kid in tow, but I figured Toshi was going to be the ideal audience to see it with) and the guys from Disney, and we headed into the big Seven Dwarves building for a digital screening of the short. We ended up watching it twice back-to-back, just so we could soak up even more of the back-to-back-to-back visual gags and design details. 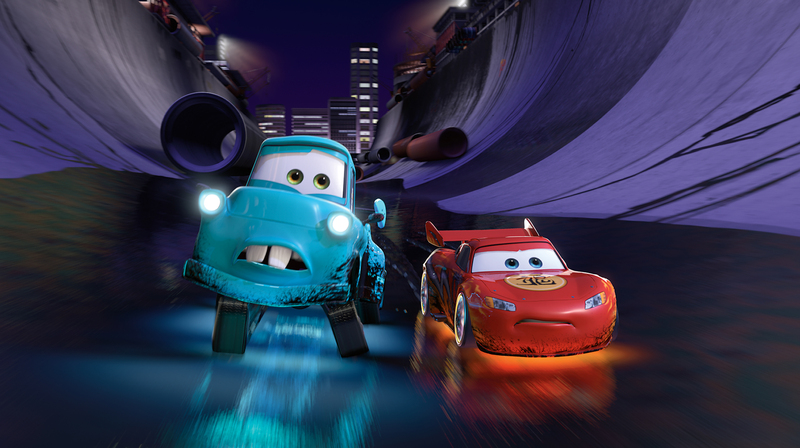 The CARS Toons are all basically tall tales told by Tow Mater, in which he fabricates elaborate stories from his past. 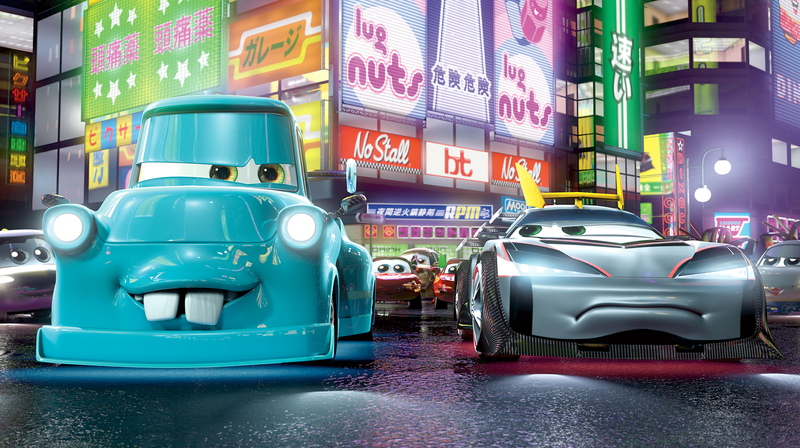 In this one, “Tokyo Mater,” he talks about his days as a drift racer in Tokyo, and it’s just an excuse for a barrage of anime jokes, sight gag references to films like MONSTERS INC and WALL-E, insane visual puns about donuts, and ninjas. It’s a tsunami of eye candy, and the 3D is used to really pull you into the screen and make the race even more visceral. Toshi had to stand up because he was so engrossed in the race both times, and I noticed something... this is the first time he’s enjoyed something in 3D. When stuff comes flying out of the screen over and over, it’s too freaky for him. We had to leave the Muppetvision Theater at Disneyland because it weirded him out so much. But with this, he seemed really involved in the film. I thought it was as visually arresting as the first time I saw TRON... that sort of crazy neon beauty.